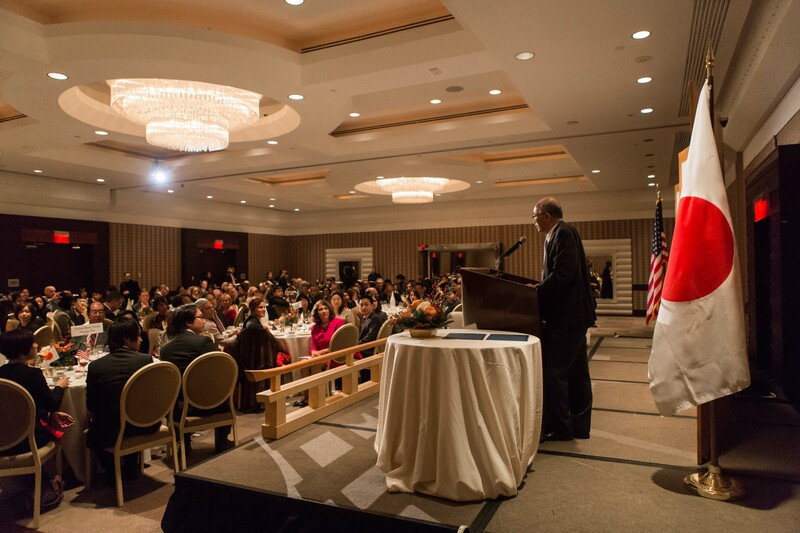 Annual Dinner – The Japan-America Society of Washington, Inc.
A side view of the ballroom at the 30th Annual Dinner in 2016, during Amb. Kenichiro Sasae’s speech. The Society’s Annual Dinner and Silent Auction, usually held in the fall, is one of the Society’s signature national programs. Over the years the Dinner has welcomed and honored some of America’s and Japan’s most distinguished leaders. The Dinner and Silent Auction are a primary source of support for the Japan-America Society’s many educational and cultural activities, which introduce Japan and Japanese culture to the residents of the Nation’s Capital Region. The 2018 Annual Dinner was held on Tuesday, November 13, from 6:00 p.m. at the Fairmont Washington, D.C., Georgetown. We are forever thankful to our sponsors, which are listed below, to those who bought tickets, and to our wonderful volunteers – together, we made the night a success. As one young professional at the Dinner stated, the Japan-America Society’s Annual Dinner is one of the best U.S.-Japan networking nights of the year. We hope to keep this statement true for many years to come. The 2018 Silent Auction will remain open on 501 Auctions until the end of November. Place your bids here.